The Land of the Midnight Sun, they call it. Around June 21, the sun will be visible here in Fairbanks for all 24 hours of the day. As of right now, a few weeks away from that, I can tell you that it’s midnight and I’m looking out the 2nd floor window of Super 8 and it’s nowhere near getting dark yet. I guess the daylight trickery was part of the reason why Jason and I felt motivated enough to chug through a few extra miles this evening and get us to our final destination. We logged in a total of 701 today, which beat our last couple days’ worth by quite a bit. The crazy part is that today we also experienced more construction and weather-related delays than any other leg of the trip. 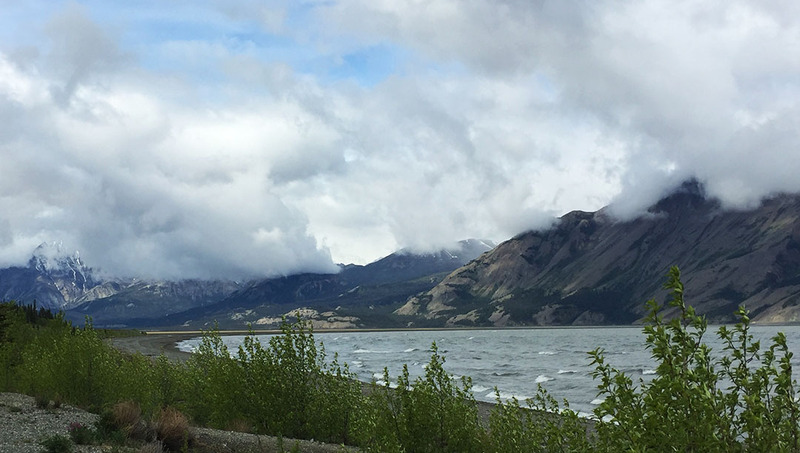 It all started at our quaint cabin in Teslin, Yukon where we headed out northbound on British Columbia Highway 97. 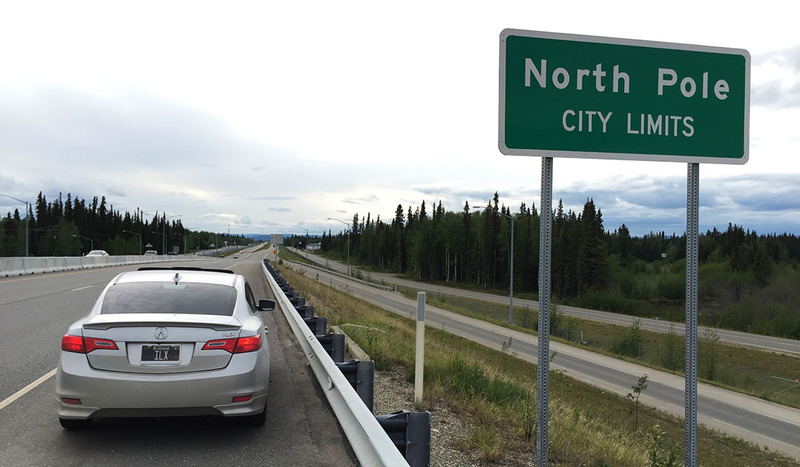 We passed a distance marker that gave us the remaining distance to Fairbanks – a staggering 1010 kilometers. I didn’t think in a million years we’d actually end up going that far today, but we did. 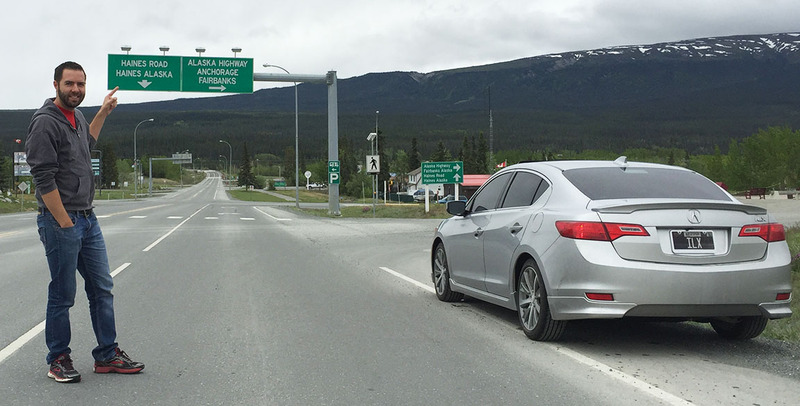 It only took us about 90 minutes to get to the capitol of the Yukon Territory: Whitehorse. It’s a surprisingly large and modern city (pop. 23,000) for being in such an extreme region of the world. 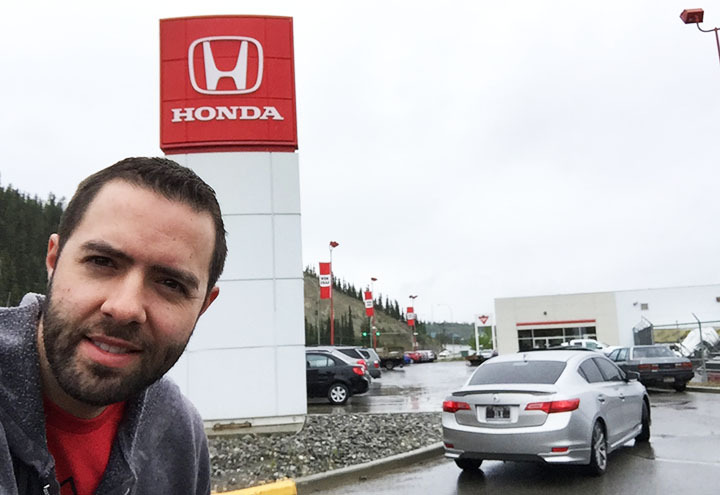 They even have (and thanks Jason for noticing from a mile away) a full-blown Honda dealership there. With a red (instead of blue) sign! 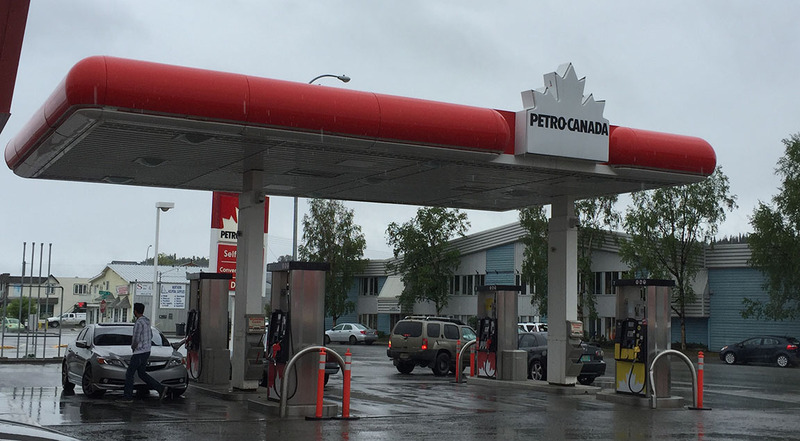 We fueled up at Petro Canada down the street and switched the wipers into high gear to fight rain showers all the way to Haines Junction where they finally let up a bit. Neither one of us had a huge appetite but we did need to use the restroom. 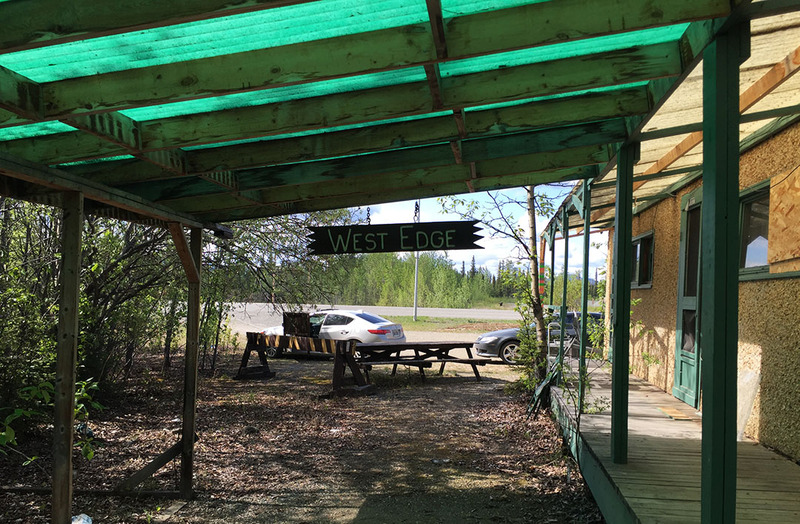 We opted to pull a roadside bathroom break in the trees when we saw that the Alcan Motor Inn had no public washroom. 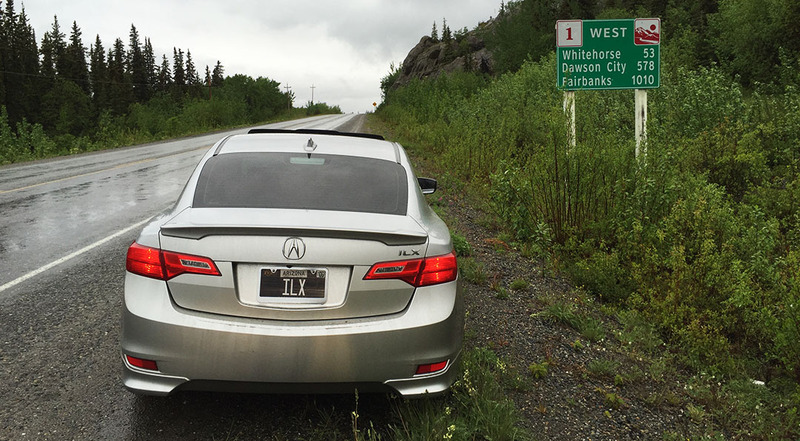 The external temp readout on the ILX showed a chilly 40 degrees outside as we made our way north-westward toward Kluane National Park and Reserve, home to the Yukon’s largest lake. The clouds began parting just enough to allow us to see a hint of blue sky as we parked the cars along the shoreline for a quick photo in the near-freezing wind. I was surprised at how large the waves in the lake were. From our vantage point on the southern shore, it sounded a lot like the ocean. 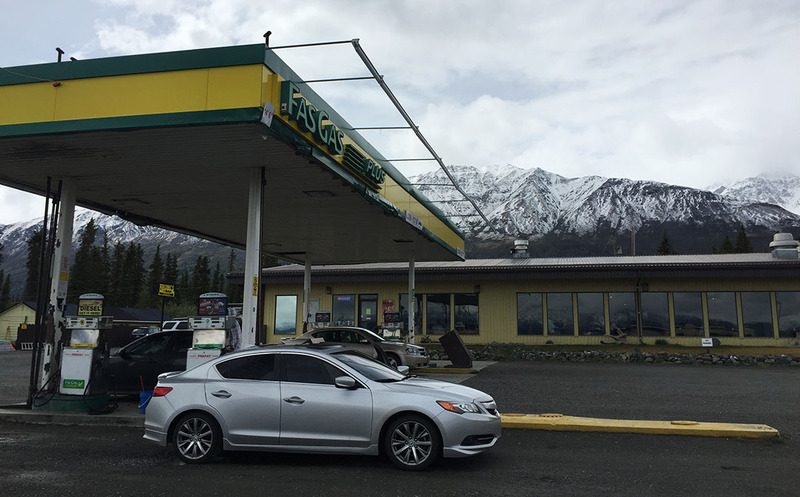 As we closed in on ½ tank fuel remaining, I decided it was best that we again top off, so we visited Fas Gas in “Destruction Bay” for some 87 octane fuel. The attendant inside had to activate the ancient pumps for us. He had a cork board hanging behind his counter where he’d clip the credit card according to pump number to keep them in order. He wasn’t very chatty but I didn’t care for small talk anyway; we had places to go yet. 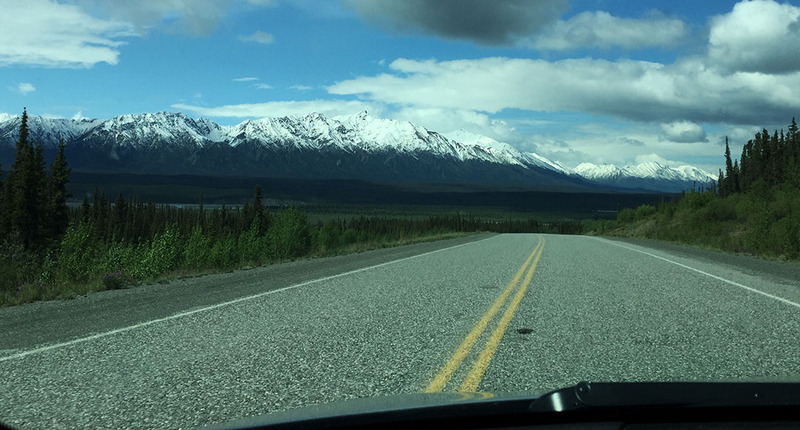 A couple of things happened around that time: The road got really bad, and the scenery got really good. Clouds parted and we now had a perfect view of the huge snow-capped peaks surrounding us. Traffic was so light I was able to park the ILX in the middle of the road and take a picture of it. The roller-coaster ride for the remaining 115 or so miles to the U.S. border gave my car’s suspension a serious workout. I think I caught air on at least one occasion. And then there was the construction. At one point, we had to wait several minutes for a pilot car to come get us and lead us through a muddy stretch of road. Meanwhile all I had to do was look at the scenery around me to realize that I didn’t care about the delay at all. 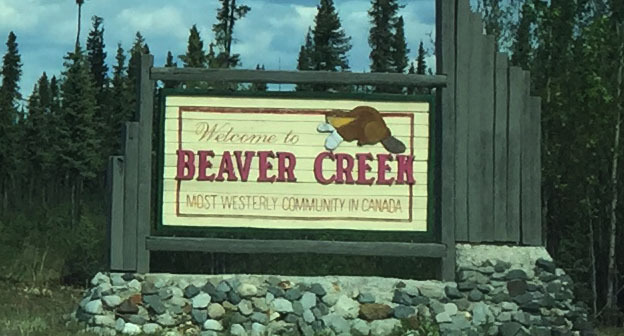 Beaver Creek, Yukon was the last stop before entering the U.S. of A. 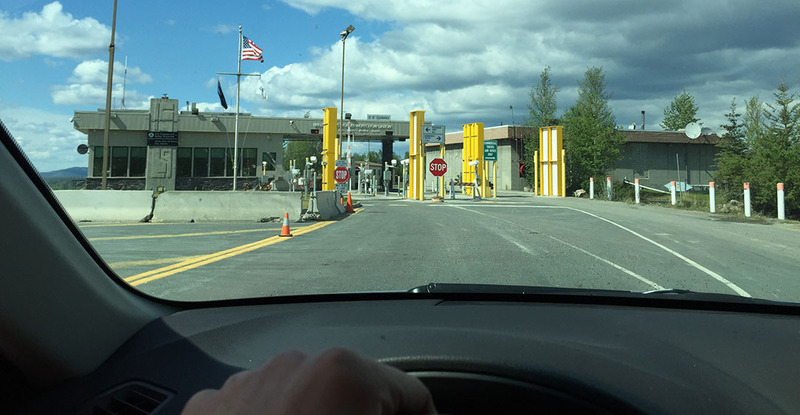 The eastbound Canadian Customs checkpoint was a full 30 kilometers separate from the westbound U.S. Customs checkpoint. 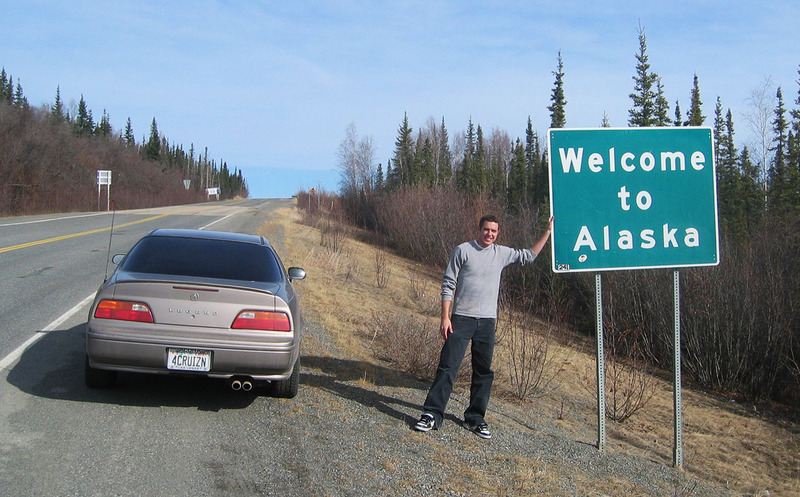 And the actual “Welcome to Alaska” sign is actually a bit before the Customs station. Odd layout, but I guess it works! As Jason and I communicated via walkie talkie, there was a definite sense of glee as we both saw the wooden sign coming up. We’d driven a very long way for that occasion. In my case, a total of 3,333 miles since I’d left my driveway last Friday morning. We staged a few photos and pressed on. This sign, by the way, has been removed sometime in the last 10 years! I was so bummed! Now we “gained” another hour, putting us an hour behind Pacific. I was ready to stretch legs and get out of the car (permanently?!) 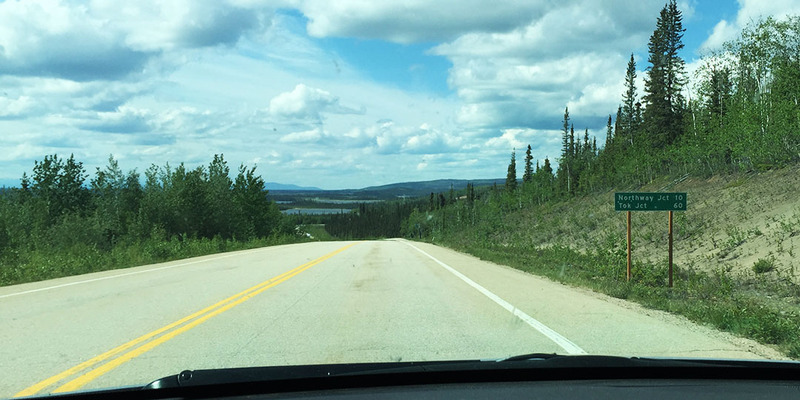 by the time we got to Tok – just starting to feel a little overwhelmed when I thought about how far we’d come, and also how far we had yet to go (a couple hundred miles). But after a burger at Fast Eddy’s, I was feeling a little more motivated. The U.S. road conditions were only marginally better than Canada’s. The presence of road markings was at least consistent. 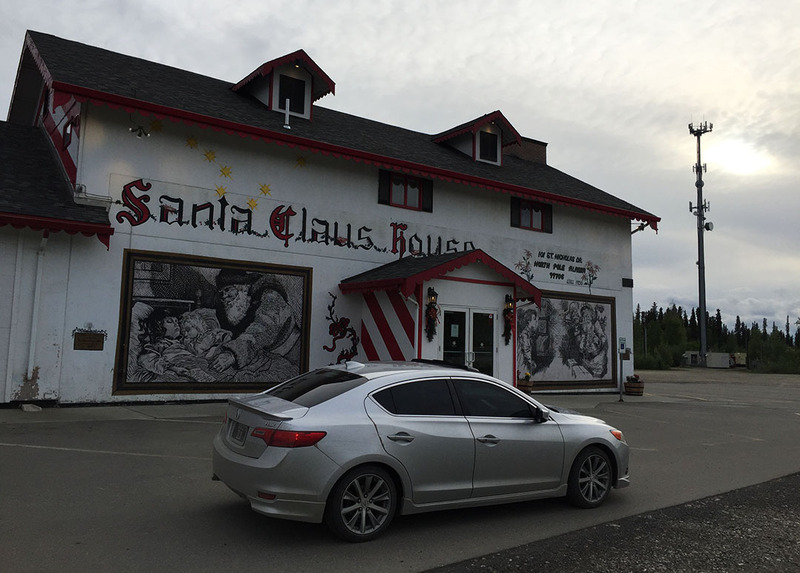 We got to the “official” end of the Alaska Highway in Delta Junction (1,422 miles since Dawson Creek, British Columbia) and there was surprisingly little fanfare. I nearly blew right past the Visitor Center, in fact. We staged a couple of re-creation pictures once again (above). Did you notice I’m even wearing the same sweater in both? 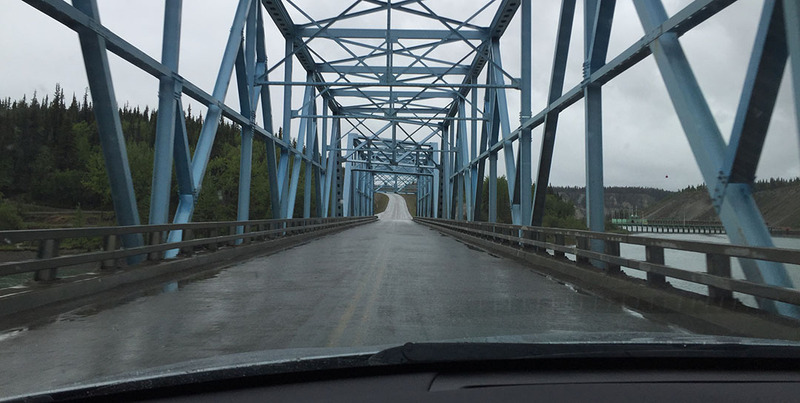 This highway was constructed during World War II as a military supply route for interior Alaska Military and Airfields in 1942. 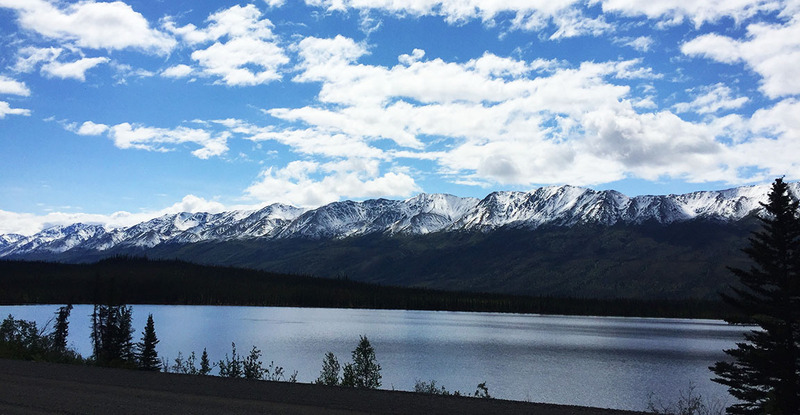 7 Army regiments and 42 contractors and public roads administrators working from Delta Junction South and Dawson Creek North completed it when they met at Soldiers’ Summit at Kluane Lake, Yukon Territory in November 1942. At the peak of construction, 77 contractors employed 15,000 men and 11,000 pieces of road-building equipment. The total construction cost for 1,422 miles was $115,000,000. 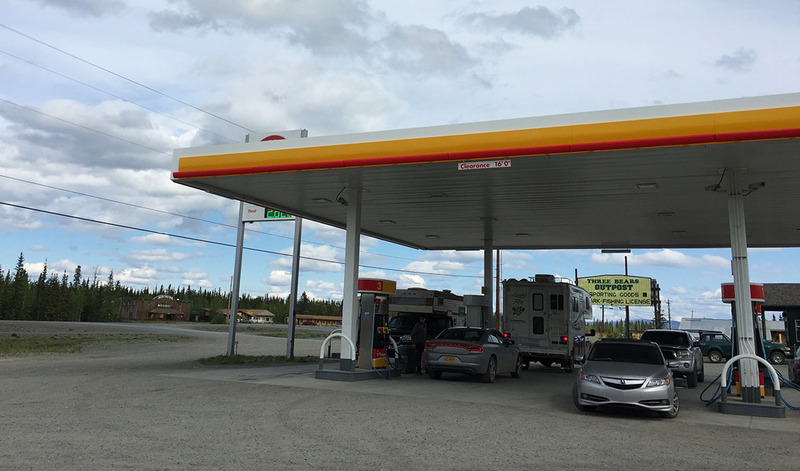 By this time I was in a “GIT ‘R DUN” mindset so Jason and I both decided, in looking at the lack of quality motels in Delta Junction, that we might as well press on and head to our finish line in Fairbanks – only 95 more miles down the road. And that we did! 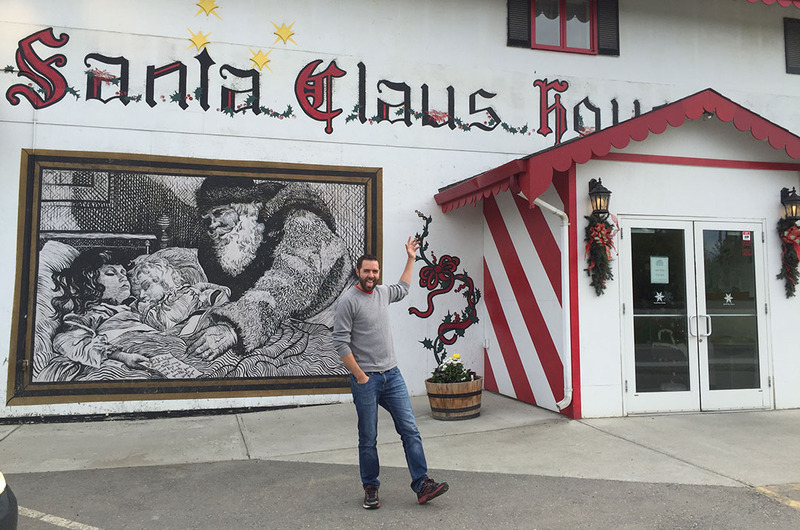 Stopping just briefly in North Pole for (of course) a picture at the Santa Claus house. 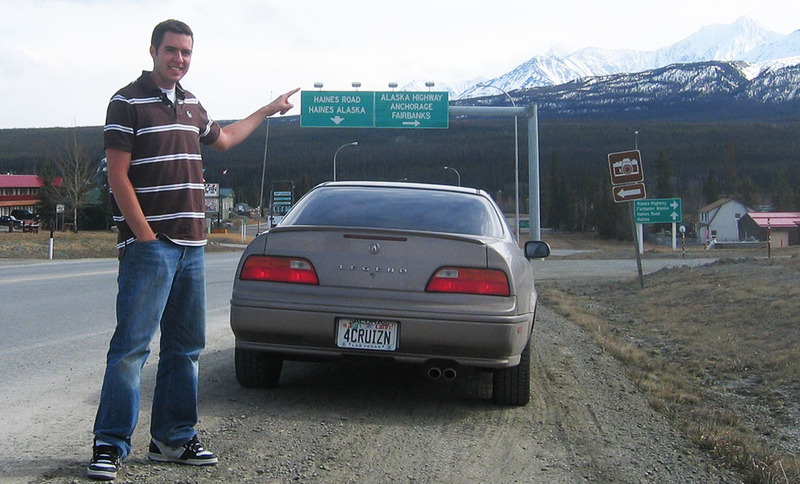 When my dad and I stopped here in 2006, I bought the deed to 1 square inch of North Pole land for $5. I should see what my property’s worth in today’s real estate market up here. And now it’s time for us (and our trusty vehicles) to get some much-needed rest. Let’s see where the trip takes us from here. 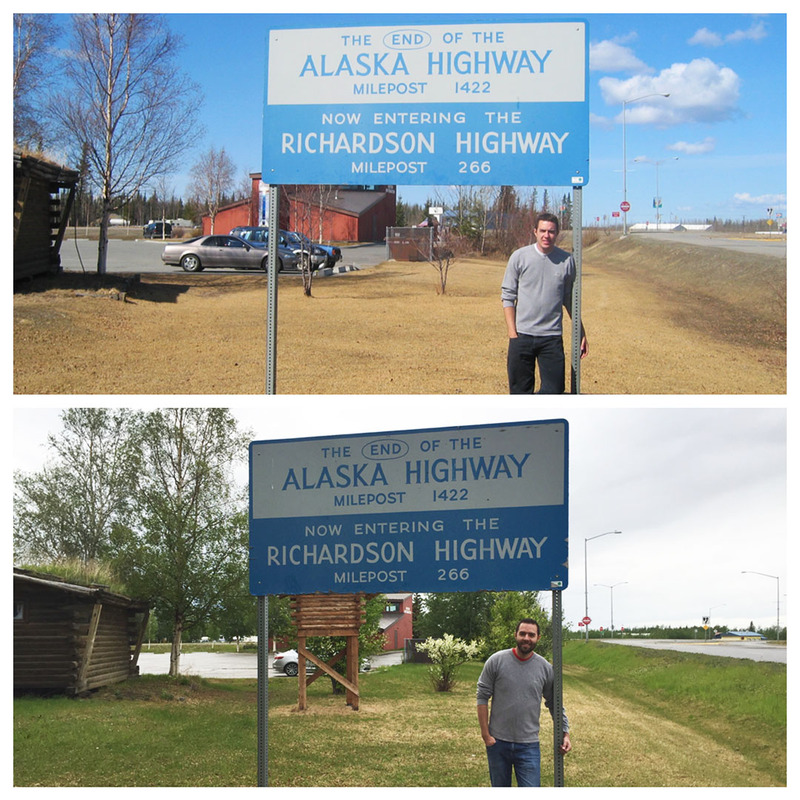 Jason has just notified me that the Arctic Circle entrance sign is just 5 hours north of us on the Dalton Highway toward Prudhoe Bay. Ten hours round trip for a sign? It’s tempting :). 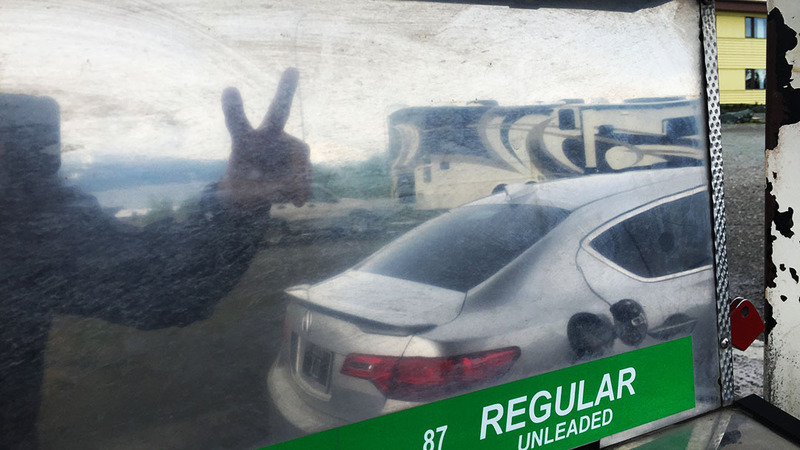 Peace sign as reflected in this ancient gas pump, filling my car with some 87 octane. View as I waited for a pilot car at a construction zone. Not bad. 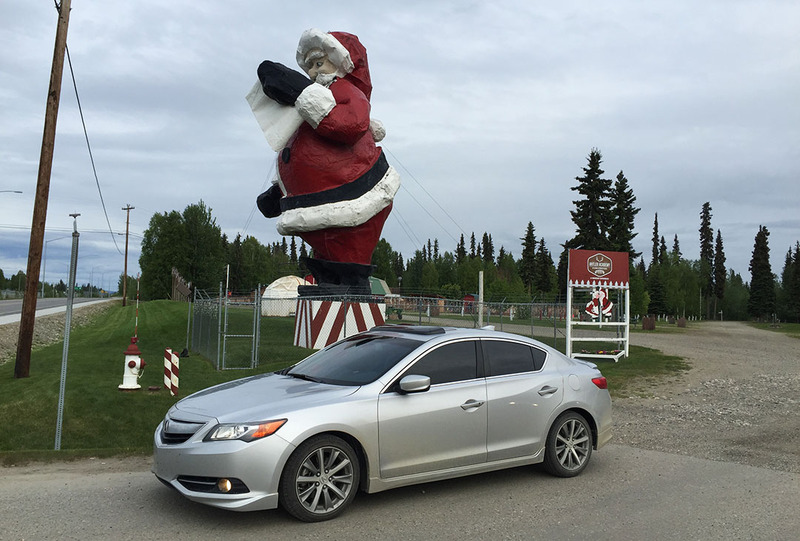 ILX at Santa’s house. Have you all been good this year? I should pick up a load of goodies for some friends back home. Fun to see my friend map and know that I’m way up here! G’nite and thanks for reading! 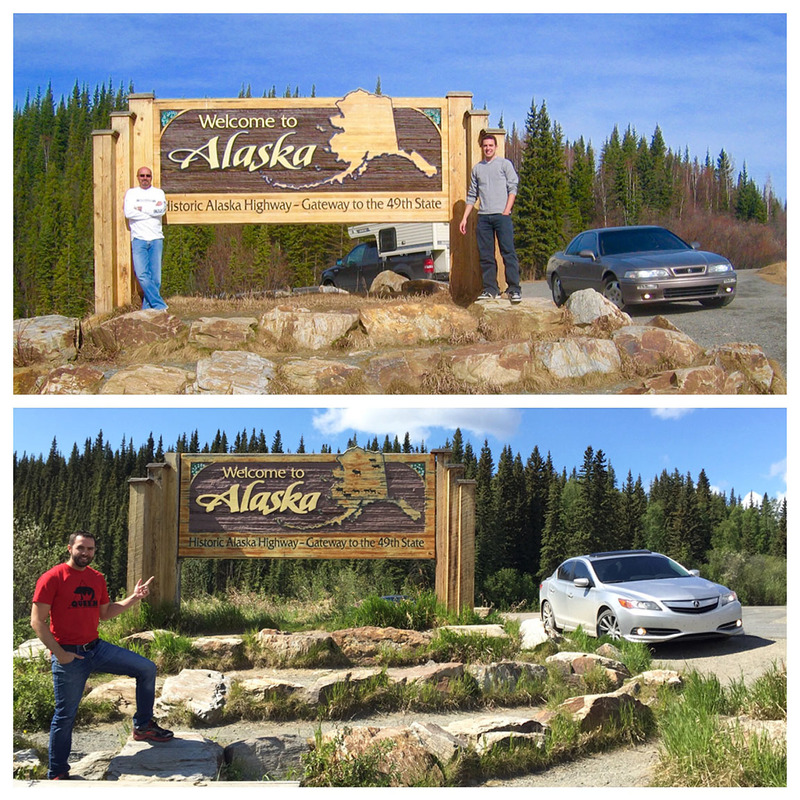 This entry was posted on May 26, 2016 at 12:11 am and is filed under Alaska, ILX, Road Trip. You can follow any responses to this entry through the RSS 2.0 feed. You can leave a response, or trackback from your own site. Jeez!!! My Alaska updates are coming in later and later each day. You do realize I live in Miami Florida don’t you?? Eastern Standard time. 😉 Are we four hours apart now? Look at the picture you took of Haines road sign and the same picture in 2006. A huge part of mountain is missing in background of 2016 pic! Is this due to global warming?? Hi there Carlos, indeed we are 4 hours apart. It’s only 7:00 in the morning out here and I’m still in bed! I might just stay here for awhile; it feels more comfortable than the driver’s seat of my car! 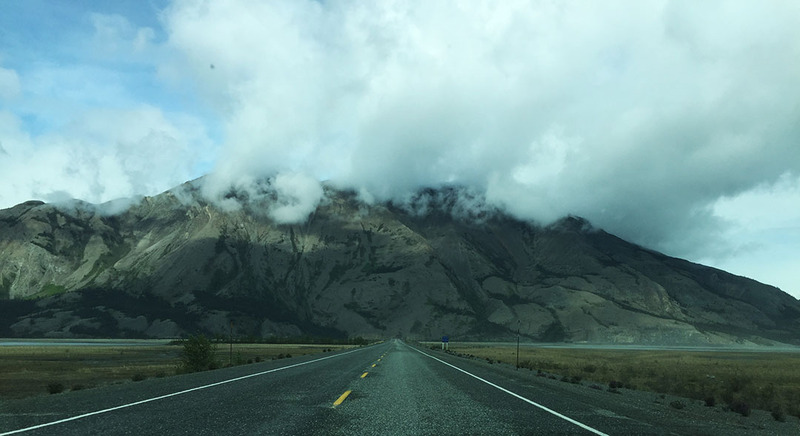 I believe what you’re seeing at Haines Junction is the fact that low clouds are covering the mountaintops. Jason and I are hoping weather is a little more clear on the return leg so that more of the peaks are visible. I had my phone off for I can see I’m a missing friend. I’m nearly in tears right now! Darn, I was wondering where my “KA” in Duluth was. That explains it. I see you in Atlanta now. 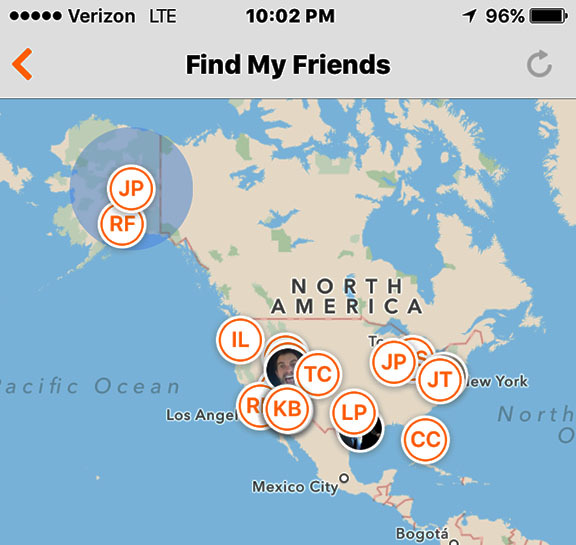 3,358 miles away as the crow flies, according to the FMF app. That’s very true! I’ll have to assess how Jason and I feel after we get up and moving this morning. He is planning on having the oil in his Mazda 6 changed today (he’s about 4,000+ miles in). I on the other hand don’t plan on doing any car maintenance. The ILX still says 70% oil life remaining! Love the pictures and 10 years previous perspective. Somehow it doesn’t seem like much has changed… except you Tyson. Strange to see Honda signage in red instead of blue, kinda like it. Did that include mineral rights? Curious how the ILX is holding up, any issues? A couple of things have stood out to me as definite changes in the last decade. 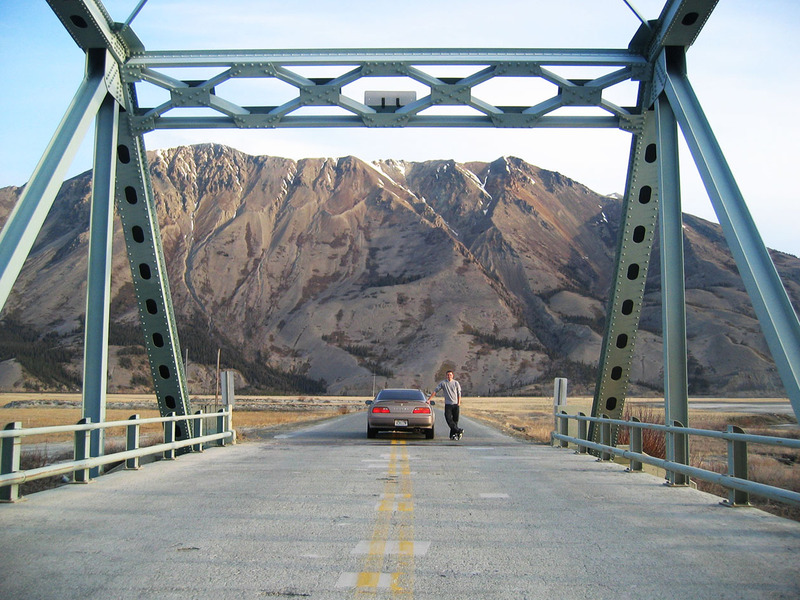 As Jason and I went through Kluane National Park, I specifically wanted to stop at a neat old bridge for photos (like dad & did in 06) but the bridge was missing! They’ve changed it to a boring newer one. I’ll dig up a picture and show you. I think I gave the deed to my North Pole land to my mother – I’ll ask her what Parcel # it is and go check on my estate when we make the return trip. Maybe I should buy another square inch or two while I’m at it? 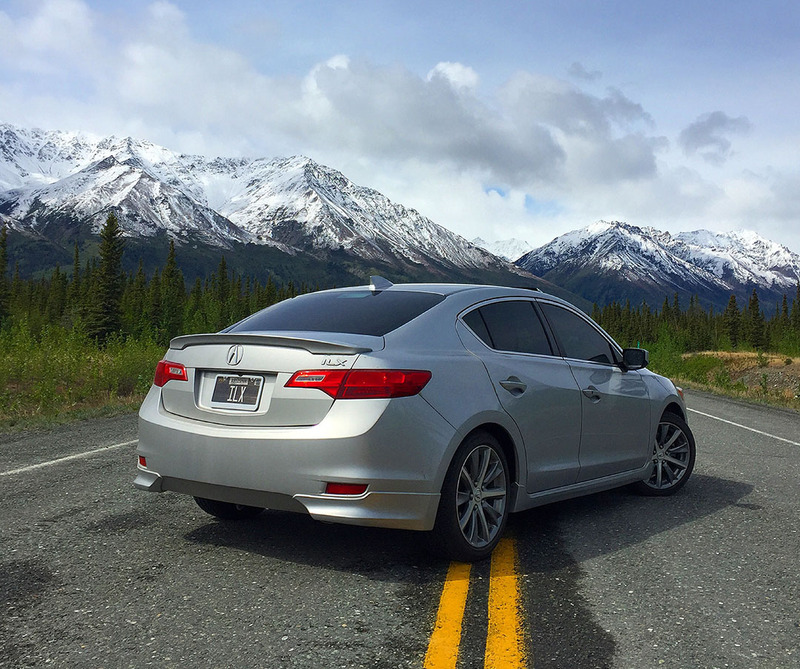 The ILX has performed seamlessly. The only thing I noticed was that the cruise control randomly deactivated once over a particularly large bump. I’m getting really poor MPG on the bad quality gas in the remote areas – MPGs have dipped as low as about 30 which I’ve never seen before now. Otherwise it’s flawless as I knew it would be. 700 miles through bad weather and road construction? You guys are pros! Maybe it’s a sign you should press on to the Arctic Circle. After all, when will you be that far north again? Looking forward to more pics of all that amazing scenery! By the way, are we seeing the effects of global warming in some cases, or is it mainly the time of year vs. your ’06 trip? Yes Jason and I missed our callings as truck drivers, apparently! Great question on the timing. The 2006 trip was from May 6 through May 14. The 2016 trip is May 20 through (about) June 3 or so. Yes it’s a couple of weeks later, but I have also been very surprised at how green everything is. Even the river in Teslin had zero ice on it, whereas in 2006 it had huge sheets. 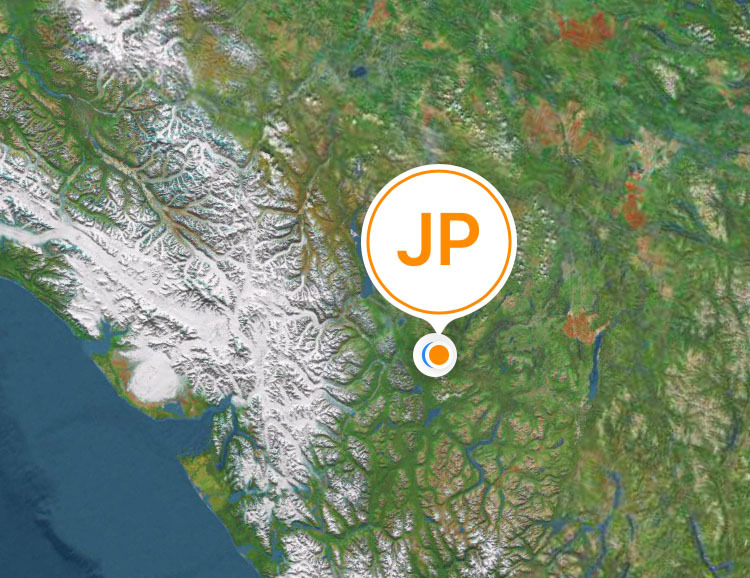 I see our friend Jake is covering up my location on that map. How rude. I was hoping for a good story involving unpaved muddy roads, getting stuck, Bison crossings, you know, things like that. Odd that only low grades of gas are offered in that area considering how many oil fields are up there. The car looks dirty in those pics…love it. Will the Mazda hit 200k on this trip? Actually we are seeing all of the above hazards except for getting stuck, and I’ll pass on that one thank you! We had in total probably 30 or 40 miles of dirt, mud, and gravel yesterday. 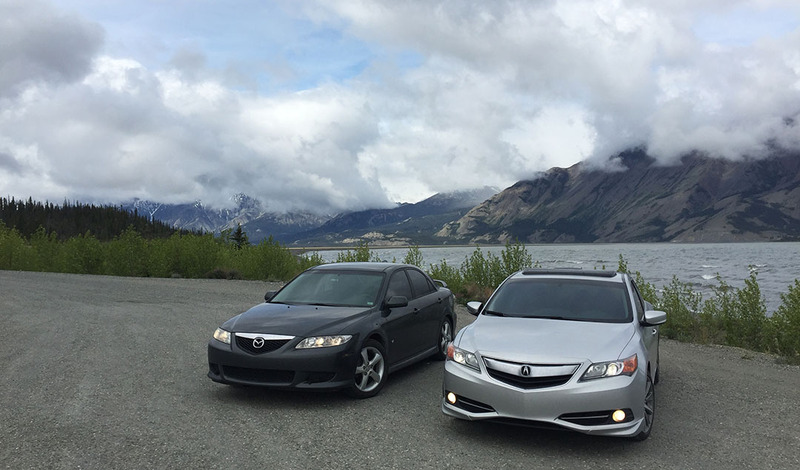 I got some very odd looks in my ILX because 8 out of 10 vehicles on the Alaska Highway are either semi trucks with big burly bumpers on them, or RVs/campers. I think the km/h speed limits are designed with big rigs in mind because in my smaller car I was easily able to exceed them (safely) especially in the more technical areas of the road. Hey, I see myself on your map! It’s been really fun watching the updates come in (great couple of minutes of distraction at work every day…) – looking forward to the rest! Awesome. There’s my resident Virginian follower checking in, haha. Thanks Jake! Glad you are enjoying following along. Big plans for your upcoming holiday weekend? So are you going to the Arctic Circle sign? You might as well since you’re ahead of schedule! Have fun! We opted out of driving to the Arctic Circle. It would be a 10 hour round trip and we are already exhausted from so many long days to get here. 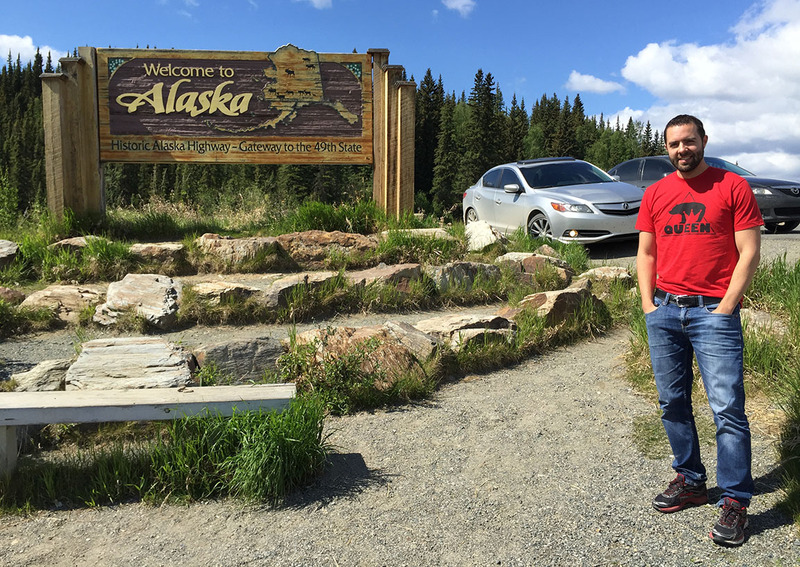 We’ve been bumming around Fairbanks and enjoying the sights, sounds, and food :). Jason’s Mazda is at the dealership right now getting an oil change. I think you’re right. I’ll save that trip for next time! But it’s going to stay on my list until I get there! Very interesting stuff! I’m going to read up on this! Thank you! 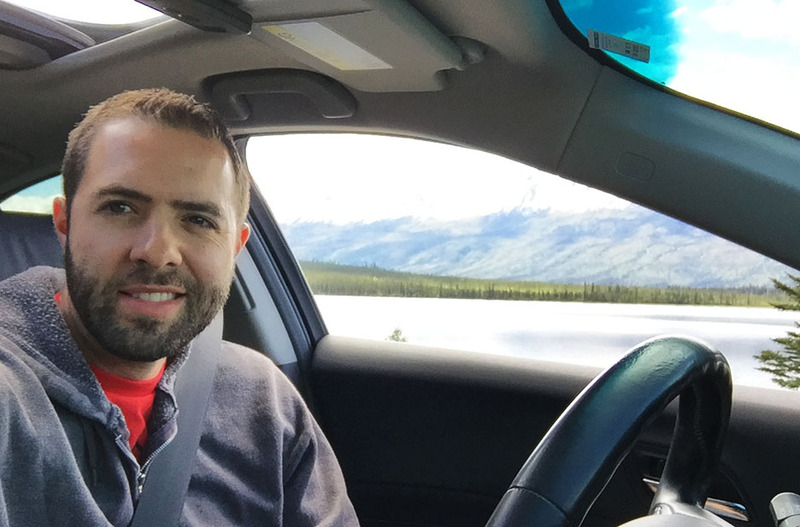 I absolutely Love that picture of your ILX parked in the middle of the road with the snow capped Peaks in the background! Thank you! When I saw the opportunity to take that, I had to pounce on it! Luckily traffic was so light it didn’t matter that I had stopped right in the middle of the road for a few minutes!